Inspired by traditional Irish knits handcrafted in the Aran Islands for over a hundred years, we re imagined this hand-woven beauty for the floor. Made of 100% New Zealand wool with the same fisherman-inspired cabling you’ll find on the Aran originals. Makes a warm and inviting statement for your home. Made in India. 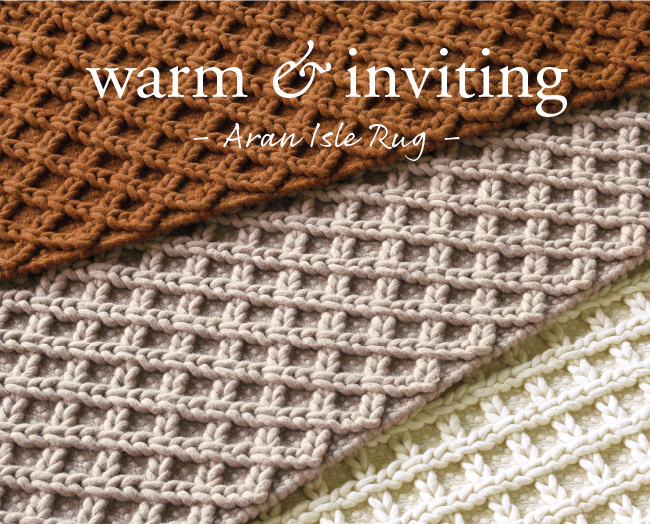 Our Elsa Throw perfectly complements Aran Isle. No doubt about it, this cozy throw is a handmade hand knit beauty, all lush New Zealand wool and fluffy warmth. Tossed over your sofa or your shoulders, it’ll bring nothing but comfort and joy (oh and texture when draped over a sofa or bed) Color: Ivory, Driftwood, or Toffee. Measures 50″ W x 70″ L.